HomeArchivesMexicoMexico and the Memory of Ayotzinapa: Whose problem is it? 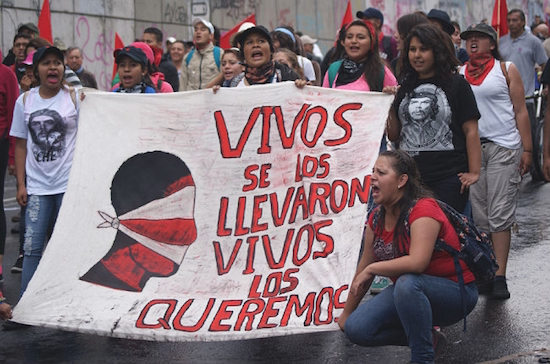 Mexico and the Memory of Ayotzinapa: Whose problem is it? “Your human rights stops with us,” we were told. That is the essence of a State that is beyond the rule of law. The entire country is being held hostage by a diverse group of tie-wearing and non-tie-wearing gangsters, with weapons and a lot of political influence. A little less than a year ago I was living in Mexico, finishing up my doctorate in Literature. I had a home, a cat, was part of a music band and had a significant group of friends. For that reason and others, I had decided (like one decides on the person with whom one wants to spend one’s life) that Mexico was my country, that it was the place I wanted to live, where I could work on projects and contribute to the country within my possibilities. The roots I had developed were deep or at least sufficiently deep so that I felt distressed and worried about what was happening in Mexico. 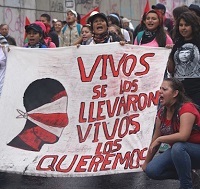 In an attack that was and continues to be inexplicable (in which the Mexico City and Federal police agencies as well as the Mexican Army was involved), three students from the Escuela Normal de Ayotzinapa (the Teachers College of Ayotzinapa) were killed and three bystanders, and at the same time, another forty-three students were disappeared. This affected me deeply and I was so worried that I attended several marches and rallies where the Mexican people were demanding justice and the truth about what had happened. In one of those demonstrations, on November 20th, I was detained while walking alone with my bicycle, and joined a contingent of people who were going in the same direction. 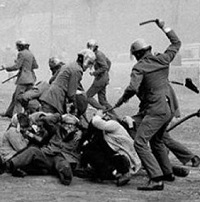 The police who detained me, beat me up very badly, dragging me through the Zocalo in the capital and soon accused me, together with ten other people, of the attempted murder of a Federal Police agent. I, nor the other detainees, whom were also badly beaten, had ever met before, yet the Federal Attorney General insisted that we were part of an illegal group that had conducted a coordinated terrorist activity. The accusation was so far from reality that it didn’t even make any sense. The “intelligence” of Peña Nieto had invented that we belonged to an anarchist cell tied to a Ted Kaczynski that hated nanotechnology. Due to the seriousness of the charges against me, I was transferred to a high security prison in the state of Veracruz, (about 400 kilometers from my home). However, and thanks to the immediate mobilization of people in demonstrations and the application of political and diplomatic pressure, together with the voices of thousands who lent their support, media coverage and outright indignation expressed in social media, we were released after ten days of hell. Obviously, this was not a good experience but I learned a few things from all that had happened, but it also brought up many questions for me. While I was in jail in the Deputy Prosecutorial Office of Special Investigations of the Organized Crime unit (where kidnappers, drug dealers and paid assassins normally end up) I was interrogated twice by high ranking security officers (among them was Tomas Zeron, director of the Attorney General’s office of Criminal Investigations, who was, without a doubt, the driving force behind the decision to jail us). During these two interrogations, the officers screamed very close to my face with such hateful expressions and tone that the only other times that I remember such images is from the dictatorship period in Chile. My response was spontaneous and sincere, I immediately told them what I thought: that what had happened to the students of Ayotzinapa was so serious that it went beyond being just a local or national problem; that the facts constituted a crime against humanity and that any person with a minimum level of sensitivity, from wherever he may have been born, would’ve been at that demonstration. The interrogation was not pleasant and it ended with one of the officials yelling that I would rot in jail. The questions were left unanswered that night; the only responses I got were physical blows. When does a case of this nature stop being a national problem and become something that attracts the attention of all of humanity, and of international organizations and tribunals? If the response is, “Isolated incidents are not enough to warrant this level of involvement but only after these become the State’s normal behavior, then the international community should react” then, regrettably, what happened to the students of Ayotzinapa is not an isolated case in the reality of Mexico, it is not an aberration, or a random event nor an accident. During the 34 months that Peña Nieto has been in the government, there have already been 57,410 assassinations. Since the year 2000, one-hundred- and -seven journalists have been killed (of which only 10 of the cases have resulted in any sentences at all). Between January of 2007 and October of 2014, there have been 23,272 forced disappearances, of which 9,384 have occurred during the first 22 months of the government of Peña Nieto. In other words, 13 people have been disappeared per day; among these are social activists, artists, undocumented and displaced farmworkers, journalists, students and people who for one reason or another become a nuisance to the government or an obstacle to the drug trafficking cartels. Mexico is the country with the second highest rate of impunity. We still don’t know exactly what happened on the night of September 26th on the road between Iguala and Ayotzinapa. What we do know is that the “historical truth”, that the Attorney General Jesus Murillo Karam shamelessly presented to the world, was exposed as being patently false after the report about Ayotzinapa that was finalized and presented by the Interdisciplinary Group of Independent Experts of the Interamerican Commission of Human Rights: the students had not been burned in the garbage pit of Cocula, but rather, continue to be disappeared. Isn’t what is happening in Mexico something similar, something sufficiently serious to warrant international condemnation? Shouldn’t we do something? Shouldn’t we take a stand? Give solidarity? Isn’t it also our problem? I want to share with you the sensation of total and absolute vulnerability that I experienced during those days that I was in jail, subjugated by a powerful force that exerts its power irresponsibly, capriciously in its greed for profit at whatever cost. The Mexican government has become infiltrated by drug traffickers, organized crime, and by sectors that want to impose a neoliberal model, Chilean style, where the only thing that matters is hoarding riches quickly by stealing and trampling on communities and people. There hasn’t been a military coup, per se, or rather, that’s not the way one could explain what is happening, because the government institutions continue to exist and are apparently still functioning, the results are more or less the same (or worse). An official who beat us until he ran out of breath during our transfer from Mexico City to Veracruz told us very conscientiously, “Your human rights stops with us.” That is the essence of the State that is beyond the rule of law. The entire country is being held hostage by a diverse group of tie-wearing and non-tie-wearing gangsters, with weapons and a lot of political influence. President Bachelet has been twice to Mexico during the government of Peña Nieto and didn’t say anything about the dark and bloody events that are happening in that country. Senator Isabel Allende, during a television interview a few months ago, expressed gratitude for the hospitality that she and her family had received during her period of exile in Mexico but she was incapable of saying anything about the constant human rights violations that have been happening in this land for many years and have grown exponentially during the past six-year presidential tenure. Lawrence Maxwell is 48 years old and has a doctorate in Literature from the UNAM, Mexico. He was finishing his doctorate when he was imprisoned in Mexico on November 20, 2014 during one of the demonstrations demanding justice and truth about the disappearances of the 43 students from Ayotzinapa. Lawrence has a Master’s in Anthropology and was a university professor at the Universidad Academia de Humanismo Cristiano of Chile. As a musician, he has created several musical bands both in Mexico and Chile, composed many songs, plays the trumpet, guitar, and saxophone and paints, writes poetry and screenplays and has directed films. He was a highly regarded high school student leader during the military dictatorship in Chile and helped to found the Federacion Nacional de Estudiantes de Ensenanza Media de Santiago (National Federation of High School Students of Santiago).